Earlier this summer a Triad Outdoor Painters (TOP) member invited us to do some painting on her property out in the country. 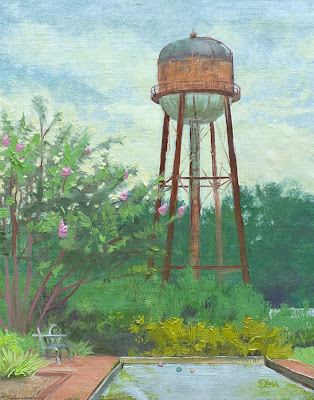 The vast land around her home was beautifully landscaped (mostly by her husband) and yet, this rusty old water tower is what caught my eye. The slightly neglected bocce court was in her yard and harmonized nicely with the tower which was located across the street.